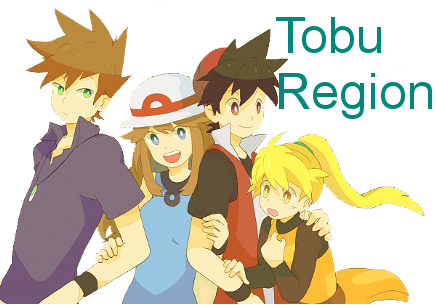 As a brief explanation, the Tobu Region is a newly discovered land in the Pokemon world. This will be the greatest challenge to everyone who wishes to enter the Pokemon world. The region brings many challenges to a person not only as a trainer but also as a coordinator, a research assistant or a breeder. Each class has its pro's and con's but I can assure you that whatever class you choose will keep you entertain. 1. Friendly Administration and Community. We all know people all hate having an administrator that is trying to rule a dictatorial in the forum. You don't have to worry about that here. We treat our members with respect and love because they are like a family to us. We are just like the parents controlling nobody is a bad child. We all help and care for each other so nothing to worry about fights and such, other than in roleplay! 2. Awesome Challenges. Not only do we have different classes but each class has a different challenge. Trainers, as always must gather all the badges and defeat the Pokemon league. Coordinators, have the grand festival to win and obtain the biggest recognition in the coordinator world. Research assistant are challenged by the Professor to make them reach the ultimate goal to open their own lab. Breeders goal is to open their own breeding center bigger than the others. 3.Plots.From time to time admins will arrange plots for the members to enjoy and to get out of their comfort zone making the roleplay more interesting. Not only do they get to roleplay differently but at the end there are certain rewards or prizes member can obtain from participating in the forum plots. 4. Events.We also have random give away due to different occasions or different festivities.